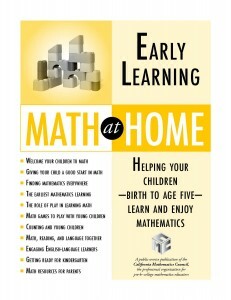 A great place for parents to start supporting their children’s mathematics learning is Math at Home, short parent guides to mathematics education. These booklets were written expressly for parents and guardians of Pre-K and K-12th grade children. Each booklet contains straight-forward information, practical suggestions, and resources for families who wish to better understand the importance of mathematics and the role they can play in helping children learn this critical subject. The California Mathematics Council wants you to share the Pre-K and K–12 Math at Home resources with parents, guardians, and families! 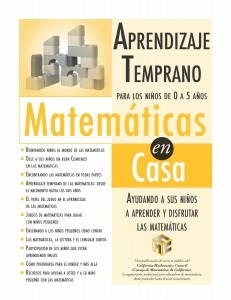 The Math at Home parent guides to mathematics education are available in editions for Pre-K or K–12 in either English or Spanish. 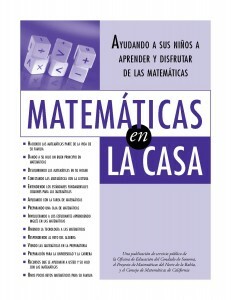 Click on any of the Math at Home cover images below to view or download individual articles from that parent booklet. 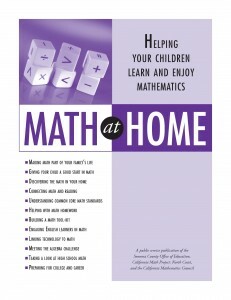 To download a FREE complete copy of that Math at Home parent guide click on the links below the cover. The California Mathematics Council grants permission to share these files with parents, guardians, and educators—all other uses require expressed permission. CMC hopes you will use these tools in your work with English and Spanish speaking parents so they might in turn work with their children to help them to enjoy, appreciate, and understand mathematics.